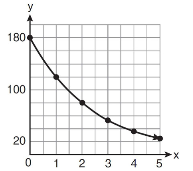 a) Does this equation represent exponential growth or decay? b) What is the initial value? c) What is the rate of growth or decay? 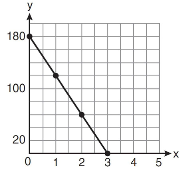 d) What is the value of y (to the nearest tenth), when x = 3? A citrus orchard has 180 orange trees. A fungus attacks the trees. Each month after the attack, the number of living trees is decreased by one-third. 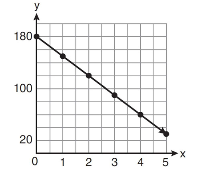 If x represents the time, in months, and y represents the number of living trees, which graph best represents this situation over 5 months? A flu outbreak hits your school on Monday, with an initial number of 20 ill students coming to school. The number of ill students increases by 25% per hour. b) Which function models this Monday flu outbreak? c) How many students will be ill after 6 hours? 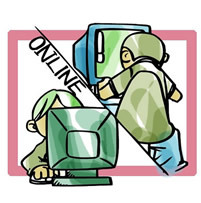 A total of 50,000 contestants participate in an Internet on-line survivor game. The game randomly kills off 20% of the contestants each day. b) Which function models this game? c) How many contestants are left in the game at the end of one week? A new sports car sells for $35,000. The value of the car decreases by 18% annually. Which of the following choices models the yearly value of the car since its purchase? At the end of last year, the population of Jason's hometown was approximately 75,000 people. The population is growing at the rate of 2.4% each year. 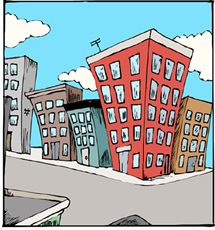 a) Which function models the grow of this city? b) How many years will it take for the population to reach 100,000 people? 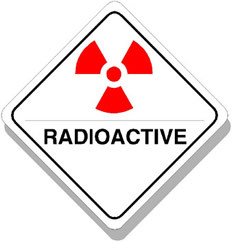 Iodine-131 is a radioactive isotope used in the treatment of thyroid conditions. It has a half-life of 8 days. Half-life is the amount of time it takes for half of the substance to decay (disappear). If a patient is given 20 mg of iodine-131, how much of the substance will remain in the body after 32 days? Geometric sequences are created by multiplying the prior term by a constant value, called the common ratio. This common multiplication occurring at each step can be viewed as a "growth factor", similar to what we have seen in exponential growth. 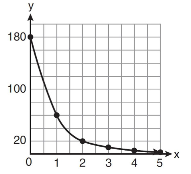 Geometric sequences demonstrate exponential growth. a) What is the "growth factor" and the "growth rate" of this geometric sequence? b) Which function models this sequence?